Homemade ice cream, whether made in an ice cream machine or using the whipping cream/sweetened condensed milk method, is easy to make and the possible flavor combinations are infinitely delicious. I did it! I finally used my ice cream machine for the very first time. It was a special occasion in more ways than one. First off, despite it being close to 20 years old, it worked. I guess in motor-years - like dog years, only different - it is still brand new. Secondly, I was sent a fabulous new cookbook full of great ice cream recipes to review. (With the promise of another copy for you, my readers! Scroll down to the bottom to enter the drawing!) 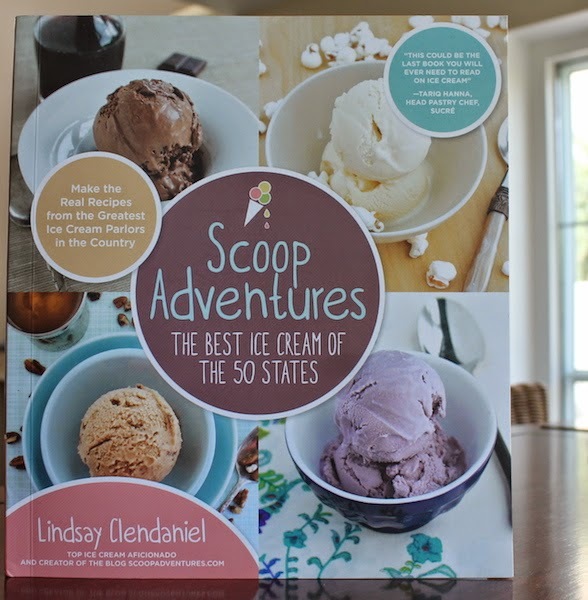 It’s called Scoop Adventures: The Best Ice Cream of the 50 States: Make the Real Recipes from the Greatest Ice Cream Parlors in the Country (< affiliate link*) and was written by the Scoop Queen herself, Lindsay Clendaniel, creator of the very popular ice cream blog also called Scoop Adventures. She brings us 50 imaginative recipes from all over the United States. I was gratified to find that Texas’ entry is from none other than Amy’s in Austin. How does Peach Honey Habanero grab you? As a person who recently made apricot habanero jam, the sweet and spicy combination sounds like my kind of ice cream! The final chapter in the book is full of Lindsay’s own creative ice creams. I am particularly taken with two: Mint Julep and Rosemary Honey Walnut. Now that I’m home again in Dubai, I REALLY need to buy a 220V ice cream maker. Seriously. I was so sad to have to leave my new “old” friend in Houston. 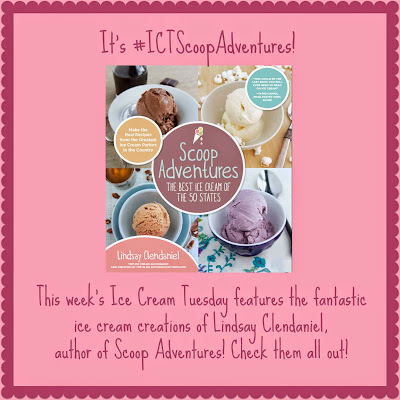 For today’s special edition of Ice Cream Tuesday, I am joining a lovely group of friends, organized by Jenni of Pastry Chef Online, all making ice cream either from Lindsay’s book or from her blog. Make sure to follow all the links in the list to see their gorgeous ice creams and have even more chances to win a copy of the book. What a round up, right? I chose to recreate Lindsay’s Thai coconut ice cream because of a special request from my younger daughter who asked for “coconut, please, but without bits.” Lindsay’s recipe calls for powdered milk but I decided to up the coconut ante by using powdered coconut cream and actual coconut cream in place of some of the coconut milk. I upped the Thai ante by using palm sugar for sweetener and agar-agar for the thickener, since they are both commonly used in Thai desserts. These substitutions ended up making the base thicker than it should be so I thinned it with more regular milk. Which is reflected in my ingredient list. I’d have used coconut milk for that too but was all out. All in all, very creamy, very coconut-ty and the family loved it! Half fill a large bowl with ice and water and set aside. Put all of the ingredients into a deep pot. Whisk to begin combining and set the pan on the stove over a medium-high heat. Bring to a gentle boil and continue whisking occasionally until the sugar, powdered cream and agar-agar are dissolved. Remove from the heat and nestle the saucepan in the ice water bath. Keep whisking occasionally until it’s cool. Once cooled completely, transfer the mixture to an airtight container and put in the refrigerator until completely chilled and softly set. Pour the base into an ice cream maker and freeze according to the manufacturer’s instructions. Mine’s the old-fashioned kind that requires ice and rock salt and churns with a big paddle. Complete churning and transfer to a freezer-safe container. Top with some coconut flakes if your intended eaters don’t mind bits in their ice cream. (Or even if some do. They don’t need to eat the top scoops!) Freeze until firm, at least four hours. I tell you, we could have eaten it right then, like soft serve. Divine! Love people. Make them ice cream. Now enter the rafflecopter and win this wonderful book! Or just go buy one. You want a copy. You really do. (The book will only be shipped to a continental US or Canadian address so please keep that in mind if you enter!) The winner will be selected by random drawing and notified by email; once the email is sent, the winner will have 48 hours to respond. If, at that time, no response has been received, a new winner will be generated by Rafflecopter. *Disclaimer: This post contains affiliate links to the book, Scoop Adventures. If you buy after clicking on my link, I make some small change from the sale and you are still charged the normal price. Win-win! I received a free copy of this book for review purposes, with no other personal compensation. All opinions are entirely my own.